Looking for a success poem to inspire and encourage; view our collection of poetry about being successful and what it means. but having much to live for. but in the palace of purposeful plans and prayerful persistence. Pessimism achieves no success over persistence. one victory never assures permanent success. his mark in life without smearing others. Work can be our friend or foe, or joy or our woe. it is a venture; more than an achievement - it is an attitude. The greatest failure is the failure to try. Alter your attitude and you will change your life. Who seeks success, let him prepare. success is the offspring of preparation. is to travel the high road of joy. 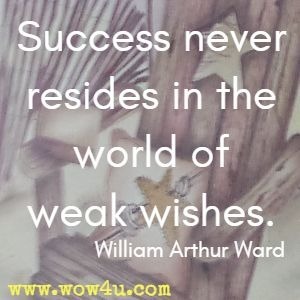 Success never resides in the world of weak wishes. People are unreasonable, illogical, and self-centered. The good you do today, will be forgotten tomorrow. Be honest and frank anyway! People favor underdogs, but follow only top dogs. What you spend years building up may be destroyed overnight. People really need help, but will attack you if you help them. Give the world the best you have and it may kick you in the teeth. Give the world the best you've got anyway! Give the world the best you've got. Is only the beginning for me to clutch. Intelligent people of like mind. Of friends who but will not do. There is more before I die. Always to find I have more brothers. A better place you see. To look upon them as no one before. In all my life reflected. This is success for all to preach. To seek out and help others is more than joy"
Or add any weight to your name. On just what you make of your job. A chance for promotion to you. To say what shall come from the job. The thing that's important is man. If you won't do the best that you can. Just what you will make of your job. Not dropped aside your door. While wishing upon a star. To be given to only the great. And they should have that fate. And rumored on how they were made. And even want to betray. Are built with hard work and care. I'm so proud to see you are there. "One life has breathed easier because you have lived"